It wasn't long ago that it was difficult to find a Google Home anywhere below $100. But with the introduction of the uber-cheap Home Mini, the demand for the regular Home has slowed down. 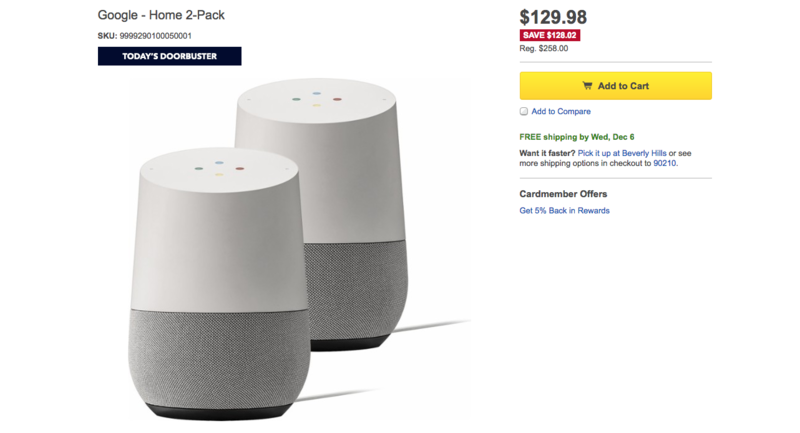 For today only, Best Buy is offering a two-pack of Google Homes for just $129.98, which pretty much makes this a buy-one, get-one type of deal. I'm sure you all know what a Google Home is by now - a Google Assistant-powered speaker that can also play music and control various smart home devices. Its $129 MSRP has basically been slashed in half, since you're essentially getting each Home for $64.99 apiece. The only caveat? The discount is only available for today as part of Best Buy's 'Today's Doorbuster' program, and I wouldn't be surprised if they sold out before then. Hit the source link to get in on this deal.